The Russian Navy's only aircraft carrier, the Admiral Kuznetsov, undergoing three months of refit and repair work at a floating dock in Russia's northwest region of Murmansk, is getting set to head back to its Northern Fleet base, Navy spokesman and Captain 2nd Rank Andrei Luzik told Russian media on Thursday. "Logistical support forces of the Northern Fleet and workers of the 82nd Shipyard in Roslyakovo (Murmansk region) launched a joint operation to bring the flagship of the Russian Navy, the heavy aircraft-carrying missile cruiser, Admiral of the Fleet of the Soviet Union Kuznetsov, out of its floating dock. 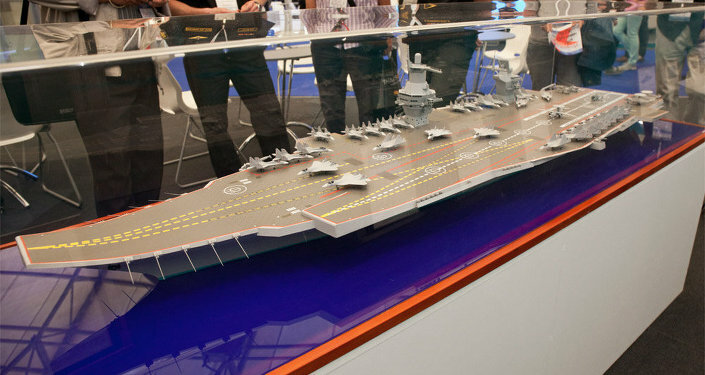 The bulk of the repair work on the aircraft carrier has been completed," Luzik reported, according to Russia's RIA Novosti. The Navy spokesman explained that during the three months of servicing and repairs, the Admiral Kuznetsov saw work done to equipment of its electro-mechanical combat section, and to the ship's drive components, while its hull saw the removal of marine sediments and received fresh paint. Further work aimed at the ship's modernization will later be carried out at the ship's regular dock near the port city of Murmansk, with crews making preparations for the resumption of regular flights by the Northern Fleet's fighter wings. The Su-33s are seen aboard the Admiral Kuznetsov aircraft-carrying heavy cruiser. file photo. The Admiral Kuznetsov, Russia's only carrier, is presently the only aircraft-carrying Navy ship in the world whose pilots regularly perform flights at polar latitudes. Last May, the ship finished its seventh long-range voyage, which lasted nearly six months.